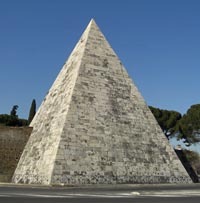 The Pyramid stands near the Porta San Paolo. It is a spectacular burial tomb of 29.50m on each side and 36.40m. high, entirely faced with slabs of marble. Its particular form is an expression the “Egyptian style” which spread to Rome following its conquest of Egypt in 30 BC. The name of Caius Cestius is recorded in the inscription placed on the east side of the monument: “Caius Cestius, son of Lucius, of the Poblilia tribe, praetor, tribune of the people, septemvir of the epuloni”. 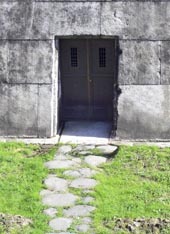 An inscription on the opposite side reveals that, in accordance with the bequest in his will, fewer than 300 days were devoted to its construction. But it was not possible to fulfil another request of the deceased: a law against luxury in burial monuments, approved in 18 BC, prevented the deposition in the tomb of the Pergamene tapestries that belonged to the deceased. With the profits from their sale there were then made two bronze statues of the dead man. Of the statues there survive (in the Capitoline Museums) only the inscribed bases on which are mentioned some of the legatees. Among these are eminent people in public life such as Marcus Agrippa, son-in-law of the Emperor Augustus, whom we know to have died in 12 BC. The construction of the Pyramid can therefore be dated between 18 and 12 BC. The Caius Cestius buried there is perhaps the praetor with the same name to whom is probably owed the construction of the Ponte Cestio, between the TiberIsland and Trastevere. He also may be the person of the same name active between 62 and 51 BC in Asia Minor; possession of the precious tapestries might in fact point in this direction. Access to the burial chamber was from the west side of the Pyramid. Vivid witness accounts of its rich pictorial decoration are found in descriptions made at the time of its re-discovery during the restoration sponsored in 1656 by Pope Alexander VII. A high wainscot and delicate candelabra framed monochrome panels in which there were female figures either standing or seated; in the angles of the ceiling, winged Victories with crowns perhaps alluded to the apotheosis of Caius Cestius. This is one of the first examples in Rome of the third style of painting. In the third century AD the burial tomb was incorporated in the Aurelian Walls and became, like the neighbouring Porta Ostiense, an integral part of the defensive system of the city. Praetor: originally, a chief of the army, then from the 4th century BC a civil magistrate with responsibility for the administration of justice.